IIFT Score Card 2019 has been released on January 25. You can download IIFT score card from IIFT website. 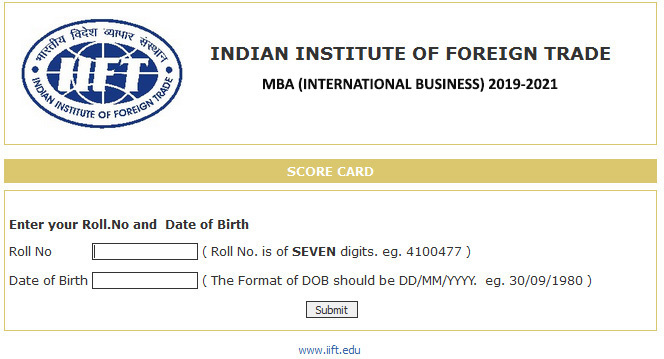 IIFT has uploaded the score card on its website. The IIFT Score card contains the IIFT scores, percentile and sectional cut offs. Many candidates could view their IIFT Scorecard 2019 on IIFT website for few hours on January 18 evening. The IIFT exam result was declared on January 15 without the score card, GD/PI dates and official test answer keys. All the 2097 candidates shortlisted for GD-PI-WAT round will be advised individually about the final selection round dates. The 2097 candidates shortlisted in the IIFT Result 2019 declared on January 15, 2019 will now get separate intimation from IIFT regarding their GD-PI dates and venue for MBA (IB) Admission 2019. The Indian Institute of Foreign Trade (IIFT) did not release the IIFT entrance exam score card along with the result declaration although the list of total number of shortlisted candidates was announced with the release of the IIFT result. Since most of the IIFT 2018 test takers have also appeared for CAT 2018, XAT 2019 and have their score cards in hand, they were waiting for their IIFT 2018 score card to fix the priorities for the right B-school. Now, they can choose the B-school with IIFT Score card, as the candidates who have been shortlisted by Indian Institute of Foreign Trade (IIFT) for GD/PI round which is to begin in February 2019 and have also been shortlisted by IIMs on the basis of their performance in CAT 2018. At present the obvious focus of these candidates is on their IIFT score card and the GDPI dates and are keeping their fingers crossed that their GD-PI-WAT dates for IIFT admission do not get clashed with IIMs and other B-schools. The shortlisted candidates will have to go through the rigorous process of IIFT final admission round which consists of Written Ability Test, Group Discussion and Personal Interview. The GD-PI-WAT round for MBA(IB) programme at IIFT is to take place from February 2019 onwards and final admission offers are expected to be received by the candidates by the end of March 2019. Answer keys for IIFT 2018 exam are yet to be published by the Indian Institute of Foreign Trade. IIFT publishes answer keys for all question paper sets which the candidates had to appear in. It is expected that official answer keys will be published along with the GD-PI dates in next 3-4 days. IIFT entrance exam is considered a bit more difficult than any other MBA entrance test like CAT/XAT/SNAP. But despite the difficult and lengthy entrance examination, more and more aspirants apply to grab one of the 420 MBA (IB) seats that IIFT offers. IIFT proposes to offer admission to 420 students to its flagship MBA (IB) 2019-21 programme at Delhi (220 seats); Kolkata(140 seats) and Kakinada (60) campuses. The 100 percent placement record of MBA (IB) students getting high compensation packages makes IIFT more fascinating than any other MBA/PGDM entrance exam.